As soon as you see one, you can't stop seeing them all the time. 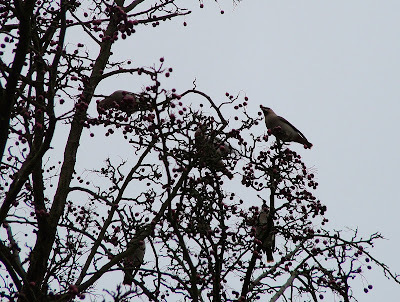 Waxwings. Waxwings everywhere. After chasing around the county hunting for these exotic little birds, I've got a flock of more than 30 just over the road in the Holmethorpe Industrial Estate by the railway line. I went down to watch them yesterday and today and a fantastic sight they make, too. In fact, it's getting to the point where I don't even have to open the front door to see them. 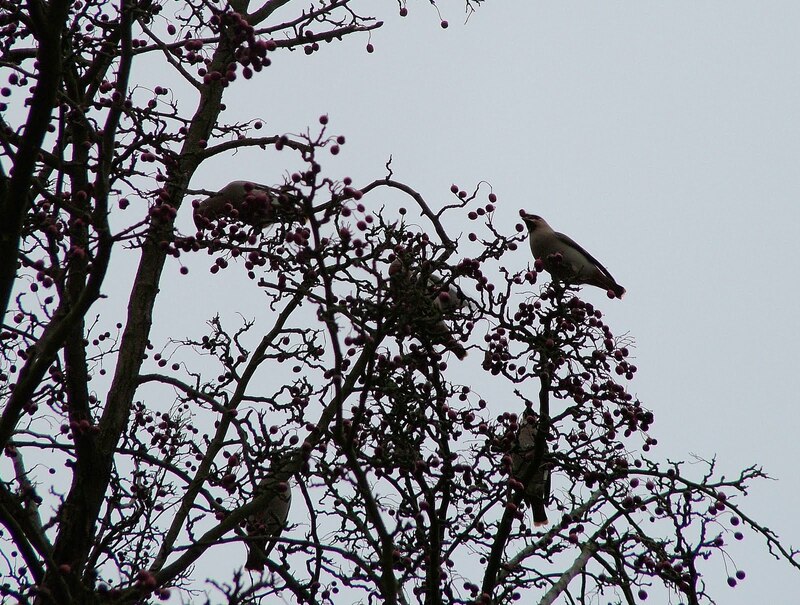 Just a glance out of the living room window, and there they are perched in a tree in Alpine Road. 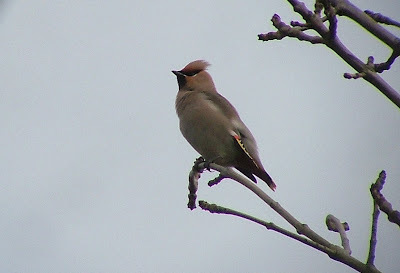 They also like flying over my house and also perching in trees 50 yards away on Frenches Road. It will be interesting to see how long they stay for - there's certainly plenty of hawthorn berries to consume on the railway embankment. My only task now is to get some decent photos - the constant flow of trains going by forces them to take to the air every five minutes - so perhaps tomorrow being Sunday, it might be better. There's plenty going on at Holmethorpe at the moment. What with Waxwings, we've got a Kingfisher or two, Little Egret, Cetti's Warbler, Smew (becoming a regular visitor), Snipe, two or three Water Rail (although we might be minus one after Graham James thinks he saw a Kestrel fly off with one in its talons yesterday) and Brambling, which I need for a Surrey year tick. Definitely well worth a good trek around the area, I would say. I'm very glad you've finally connected, Neil! There couldn't really be a better way to get them in the end.